Heavy duty relay assembly will handle 50 amp power cord and up to 12KW generator. Transfers two hot poles and neutral simultaneously. Generator start up delay is provided to allow the generator to get up to speed. 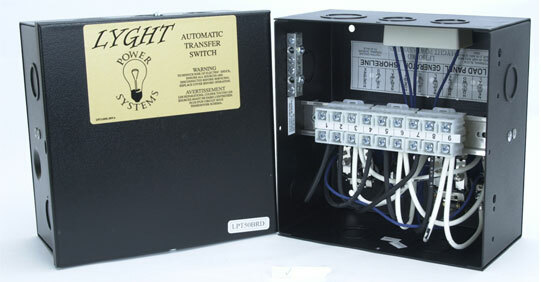 Utilizes a micro switch on the neutral relay to ensure neutral lines are engaged before the hot lines. Designed with DC coiled relays to reduce hum, and terminal blocks to simplify wire connections. The LPT 50BRD is intended for usage as an electrical transfer switch to automatically switch multiple sources (from one to another), i.e. switching from shoreline to generator power. The LPT 50BRD is primarily designed for installation in conjunction with a generator having a rated output of not larger than 12KW, an external power cord having a rated output of not larger than 240VAC, 2 poles 50A per pole, 1PH, 60Hz. Time Delay Custom time delay, 30 seconds nominal can bypass for instant switching. Will not work Winnabago with Energy Management Unit. This product was added to our catalog on 10/13/2009.